Romania is yet another country we visited in the Balkans - and as usual we were not disappointed by this amazing region! From old medieval castles and towns in Transylvania to the mountains in the center and real Paris of the East - Bucharest, Romania turned out to such a pleasant and beautiful place (although Bucharest was my least favorite place in the country). It's cheap and affordable - and food so delicious. The places not to be missed are Brasov - with an amazing hill that bears a sign similar to the famous one in Hollywood overlooking the beautifully preserved medieval center and Sighisoara - probably the most beautiful medieval town I've ever seen - looks more like a film set for a Disney Movie rather than an ordinary village. Also, you'll be surprised that town houses can have eyes! Just check out the post about Sibiu and see for yourself. Don't miss the Transfagarasan mountain road - one of the most photographed roads in the world. If you love castles, you'll love Romania - they are spectacular - especially the Peles castle. The most famous castle in the world - Dracula's Castle is also located in Romania. Here, you can visit a medieval torture chamber - a thrilling experience that would give you a goosebumps. But Peles is better! The architecture, rooms and halls are unreal. Romania also has amazing nature - beaches on the Black Sea (which, unfortunately we did not visit the coastline this time) and mountains - especially the peculiar natural Sphinx Rock in Becugi Mountains. 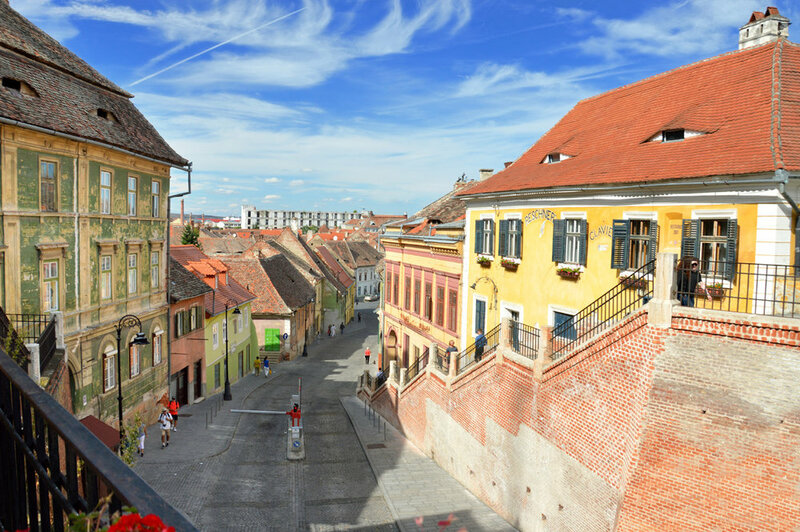 Initially, Sibiu wasn't included in our itinerary of the places to see in Romania. We visited it by pure coincidence. We stopped there while traveling from Brasov through Sighisoara to Bucharest. And what a nice surprise it was! Without zero expectations, this Transylvanian town turned out to be so charming that we decided to spend there a whole day. What’s surprising is the fact that there's one unique touch that defines Sibiu - the old town houses there seem to have eyes! The Bran castle is probably Romania's most popular tourist attraction as its associated with the main character of the famous vampire story - Dracula. Located in the forested region of Transylvania, it's easy to reach and visited by hordes of tourists and organised groups. But what is the castle really like? Is it unique and worth seeing? Or is it yet another overrated tourist attraction? Bucharest, Romania - The Real "Paris of the East"
Bucharest was the last place on our itinerary in Romania, before heading more east - to the mysterious and least visited capital in Europe - Chisinau (soon I'll write a post about it). Unfortunately, this time we didn't have a chance to make it to the Romania's Black Sea coast resort city - Constanta. After visiting somehow fairy tale-like scenery and medieval towns of Transylvania, Bucharest seemed a lot different. More rough, grey and heavy. Hundreds of concrete blocks everywhere, landscape filled with brutalist architecture. But there is one place in Bucharest that lets you escape the gloomy, communist atmosphere - the Old Town. Many cities have been called the "Paris of the East" - Warsaw, Beirut or Budapest. However, Bucharest Old Town is the one that truly resembles the French capital the most, in my opinion.